let's start with the important thing - i did not get anything free for doing this review. i bought ynab (you need a budget) months ago, when kym talked about it. i've been using it successfully ever since, it's the one financial/budget thing i can stick with. i think it's a huge part of why i'm now debt free. i've talked about it before but i decided to do a whole post on it in case you wanted to try it to. then i contacted the ynab people and asked for a copy of the software to giveaway, which they were kind enough to provide. but this review was coming regardless of the giveaway - you just get a special treat! and second housekeeping thing - you can get a 34 day free trial here and if you want to purchase, you can get $6 off using this referral link. what is ynab? ynab is budgeting software. (once you buy it it, you can get it on any computer and your phone, it all syncs together via dropbox.) like a fancy excel spreadsheet. the math stuff is already built in so when you enter transactions, you don't have to add or subtract or carry it over to the next month. the best way to get a feel for this really is downloading the free trial and testing it out. how does it work? you enter in your available funds. each time you get paid, enter that in as available income. then budget it! you set up the categories. some of mine include groceries, rent, pet supplies, as well as savings goals (birthday in nashville!) and 'rainy day funds' like unexpected vet bills. you decide how much goes into each category. the first couple of months may be trial and error while you figure out just how much you spend on groceries, etc. but that's the benefit of the software. you just roll with it, if you over spend in one category, you move around the money in the other categories to make it work. if you can't make it work, you know you're spending outside your means and you need to cut back. as you can see here, you enter each transaction in as you spend, just like that check register you never used. get the phone app, that makes this part easy. you enter in where you spent the money and what category it's coming out of. why is it better than free apps? 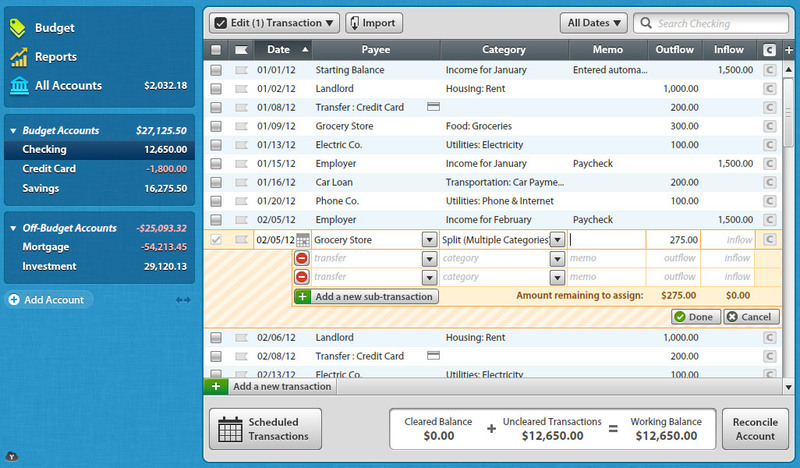 i've used mint and learnvest and various other budgeting apps. the problem i ran into is that those are very backwards looking - you link your accounts, then it's very passive. you just log in and look at where your money went. ynab is active, and forward looking. it does not sync with your accounts (i mean you can import old data, but you won't need to.) you enter in your paychecks and then you tell your money where to go, which category it goes in. every single dollar is accounted for and you can see that it's earmarked for a special purpose - like if you get paid on the 15th but you don't get your electric bill until the 28th. no guessing game. the free apps work great, if you can be diligent. but if you're reading a review on budgeting software, you're probably in the same boat as me. not diligent. what else? they offer free online classes. and also transcripts of those classes in case you can't make it. they tell you all the basics and tell you how to work through more complicated things like paying off credit card debt and dealing with different pay cycles. definitely take all the classes! i love it. there's no way i'm writing out a budget on paper each month, there's just not. 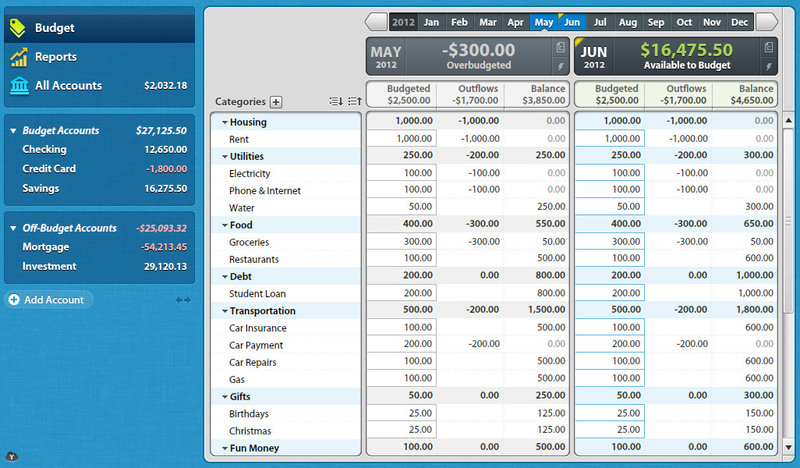 this software actually makes it fun - the best $54 i've spent all year. worth every penny. what else do you want to know about it? i'm here to answer all your questions! oh right, and now, win! A friend of mine swears by YNAB, and I really need it. I just haven't been able to justify the cost yet. Winning would solve that. Slightly squealed when I saw the title of your post...a giveaway I'd love to win :) Thanks for the chance! Wow, that sounds impressive and useful. I am so bad at budgeting! I'm almost afraid of such a program because to see how much of my money goes to clothes and food would just be embarrassing, BUT, it would be the first step to being more disciplined. This sounds awesome! The accountant in my is obsessed with budgeting! I need this bad. The way it described budgeting makes perfect sense. I really really want this. I need a budget bad!! I got confused because I read Fug Girls all the time and NAB over there means Need A Bracelet, haha! We tried making our own budget on Exel, and it just hasn't worked. I'm so intrigued by this! Random question, but as a college grad this summer I won't have a very steady income (just working at Bath and Body Works, lol). Do you think this is something that would be helpful in helping me pay off my debt, even if I don't have a very steady income? This is pretty interesting... I need some help with my budgeting, STAT! I just recently downloaded the free trial, so this giveaway is perfect timing! I'm looking forward to using YNAB! I hope I win!! We have been trying to get organized with our debt and get it paid off. One of the big things is I like the computer and he likes the paper version and seeing it. We tried Mint and he didn't like it. Oh gosh I love this! I always do my budget on an excel spreadsheet, it doesn't look at pretty as this though....would love something like this! I started as a personal finance blogger and people raved about YNAB all. The. Time. Now I understand why. I've been wanting to try this for a while! I need that SO BAD. That looks awesome but I get so weary of products that have all my information in one place....I know I need to get over it because this looks like a great product! You are my favorite! Even though I know I'm pretty organized and on the ball you always find a way to step up the game, and I love it. Can't wait to try this out.